Welcome to our Frequently Asked Questions. We appreciate your interest and hope that you find what you need below. If you have any questions, please do not hesitate to email or call us. What is the Alpine Park and Gardens? 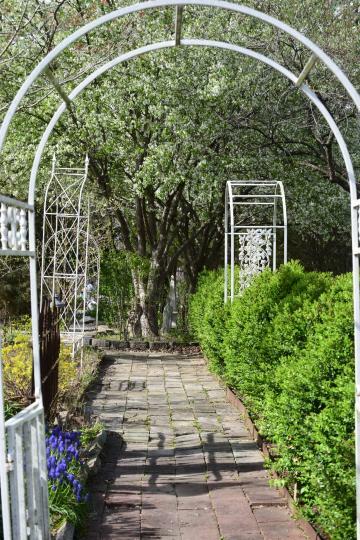 Alpine Park and Gardens is a 40-acre conservatory with garden rooms and natural areas. As a developing botanical theme park, it is special because of its unique and beautiful nature. With its exquisite outdoor amenities, the Alpine Park and Gardens makes hosting your extraordinary events unforgettable. With what amenities is the Alpine Park and Gardens equipped? We operate lovely floral gardens and water features. Trails, an elegant amphitheater and the spectacular Timber Frame Pavilion create the perfect atmosphere for your extraordinary event. 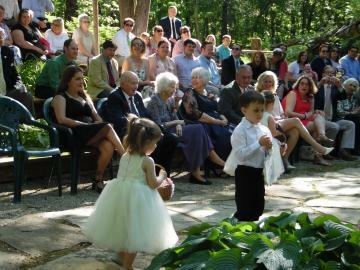 Restrooms and Lighted parking, Bride's Suite & Groom's cabin , photo booth, grilling area, small kids play swing/slide set (all children must be supervised at all times by their parent/guardians.) 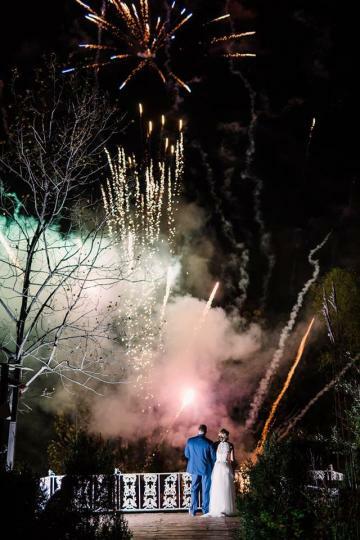 Fireworks at an additional fee is optional for our guests. We can also host a live band for those who want to bring their favorite band out here! When can the park be reserved? What are the opening times? For your convenience, reservations for special events are taken at anytime. For reservations or appointments to view the amenities of Alpine Park and Gardens call (573) 443-7106, contact via e-mail at alpinepark@centurytel.net or online submit the contact form ( use the "Contact Us" Section). Sunday thru Thursday's ( April to November ) are good for tours otherwise events are usually occurring - check the calendar. Off season pretty flexible ! Times are pretty flexible as well. usually 9am to dusk or there abouts daily. Our different amenities can accommodate a different number of guests. For events requiring sitting: the pavilion holds 225 seats, the amphitheater provides over 200 seats, and the grounds hold over 200 seats. This is also determine by each and every logistical setup plan. The grounds can accommodate larger events depending on the nature and time of event. Contact us for more information! What services does Alpine Park and Gardens offer? We are an experienced full-service facility. We are more than happy to assist you with your event. Simply schedule an appointment and we will look at your needs and work out the best way to help you. Our services include event hosting, bridal consulting & event planning on site. We also provide third party vendor referrals through our network ( Barry's Blue Book ), such as officiate referrals, caterer services referrals, music referrals, and floral shoppes with table decorations. Barry also consults on ground and landscape consulting, design, installation and maintenance and over all property management plans. Which hotels provide easy access to the park? Yes, outside vendors are allowed. Alpine Park and Gardens has amenities to assist each and everyone from floral needs to a food handling area for caterers. As a fully functioning facility, Alpine Park and Gardens can accommodate most needs for vendors or those guests who wish to do it themselves. A $700 booking deposit is required at signing and is applied toward the total invoice. Also, a $500 security deposit is required 6 months from scheduled date and is refundable and/or prorated upon cancellation. If your event is on point then we roll this over as a second payment as an option.Refer to current contract for fee schedule and due dates, check also the pricing page. The Alpine Park and Gardens rental starts with figuring out a package and adding services as options. The time begins when your invitation announces so. Decorating, dressing, photography and rehearsal times are complimentary. Time extension fees does apply and must be prepaid. Staff, rental items and services are additional. There are packages available ( we start there ). Refer to Packet for package and rental items, check also the pricing page. Is there space for the bride and/or groom to get dressed? Yes, a suite is available for use for bridal preparation ( package 2). There are plenty of mirrors, dress rack and a comfortable area to get ready, rest room and an actual hair & makeup station. The antique setting gives a sense of tranquility as you get ready. This room also as a special feature !!!! " 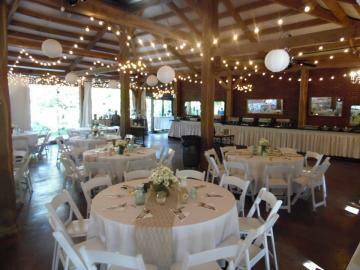 Only at Alpine "
Can Alpine Park and Gardens hold receptions and other events? Yes, Alpine Park and Gardens can be turn-key event to a hands-off event with oversight. As a park, we offer a lot of flexibility in hosting events such as fundraisers, family reunions, business, live bands or social occasions and meetings. Can we bring in our own stuff? One can bring in their own food, alcohol, music, decorations, etc. Our over-sight includes that everything is done properly and is done in a timely and professional manner. Please be considerate and ask for permission from the Alpine Mgmt. before bringing an animal to an event and that includes service animals as well. . All visiting animals must be leashed and under control the whole time. We are dog lovers and have two golden ret. /Lab that are spoiled and it is their home. Animals will need to have a meet and greet session ! 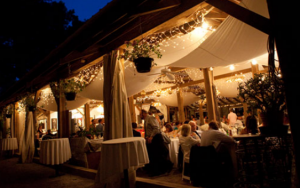 Alpine Park and Gardens' pavilion is a fixed roof structure that has a heavy white boat sail drape that allows us to open up one side or totally close it up. 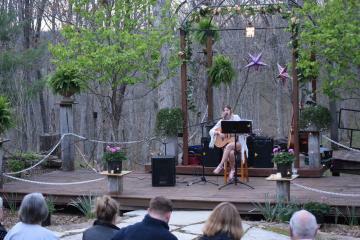 An attached enclosed covered deck and stage further buffers the event from the elements. On another note - we live on earth and weather will be an element regardless of where you are , time day, etc. It is who can make the Best of it regardless that counts! Alpine Park and Gardens use citronella lamps throughout the park proper and are lit prior to events to allow the citronella to permeate in the air. 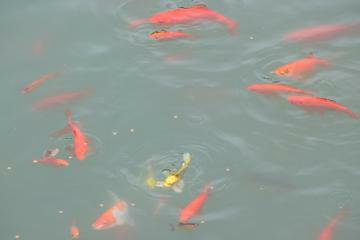 The martin houses and abundance of fish also assist us with control. Do you have any references from other couples? References are everywhere ! My site, major wedding sites, other vendors - check out cyber world today and if you need a really great one talk with us! What about the 7-acre Japanese Garden? We are currently implementing several items in this garden area. The finishing touches of the Tea house will occur in 2019. 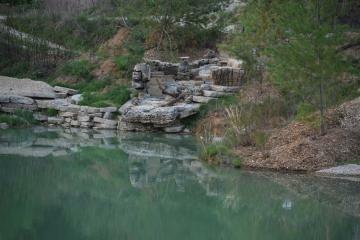 A rock walk way will circumvent the river pond as well. A amphitheater style sitting area is being installed for a ceremony site over looking the water pond on the reservoir pond. This is an ongoing creation of space that has numerous projects ( plantings, mulching , etc. ) within a project, being done and is taking shape . Some of these items require nature to be accommodating and is the guiding force when things can be done. There are several vendors in the area. MoX - 573-441-1122 has shuttle vans. Celebration Party Bus & Limo 573-489-9070 speaks for itself. Taxi Terry's service is good 573- 441-1414.. Please refer to Partners page for more resources.